Madeleine de Scudéry, "the Incomparable Sappho"
Ridiculed and satirized by many of her male contemporaries, Madeleine de Scudéry was, despite her critics, a wildly successful novelist whose works were quickly translated and published in England, Germany, Italy, and Spain. The daughter of a minor aristocratic family, Scudéry was orphaned at the age of six. She was raised by an uncle who provided her with an extraordinary education: in addition to reading, writing, painting, dancing, and music, he exposed her to the study of agriculture, medicine, and "domestic economy." On her own, seemingly, she learned Spanish and Italian and developed an interest in philosophy. After her uncle's death in 1637, Scudéry left Normandy for Paris, where she joined her brother, the playwright Georges de Scudéry, who introduced her into the vibrant salon life of the city. Her "pretensions" in becoming a regular figure in the salons--and then in establishing one of her own--are what seems to be the source of the ridicule directed at her. Or at least one source. She also dared to write, at first using her brother's name as her pseudonym. Her first two works, the historical novel Ibrahim, ou l'illustre Bassa (Ibrahim or the Ilustrious Basa,1641) and the series of angry orations delivered by famous women, Les femmes illustres, ou Les harangues héroïques (Illustrious Women or Heroic Harangues, 1642), were both published under Georges de Scudéry's name. 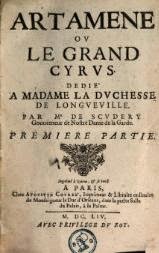 Her Artamène, ou le Grand Cyrus (Artamène or the Great Cyrus), published in ten volumes (over two million words!!!) between 1648 and 1653 brought her fame and acclaim (and the subsequent ridicule). * The historical romance was set in ancient Assyria and featured fictionalized versions of her contemporaries, with Scudéry writing herself as Sappho. She continued to publish fiction, both multi-volume novels and novellas, but Scudéry also published philosophical dialogues (such as Conversations sur divers sujets, [Conversations upon Several Subjects, 1680] and Conversations morales [Moral Conversations, 1686) and epistolary fictions, following the model of Ovid's Heroides, in her Lettres amoureuses de divers autheurs de ce temps (Amorous Letters from Various Contemporary Authors, 1641). 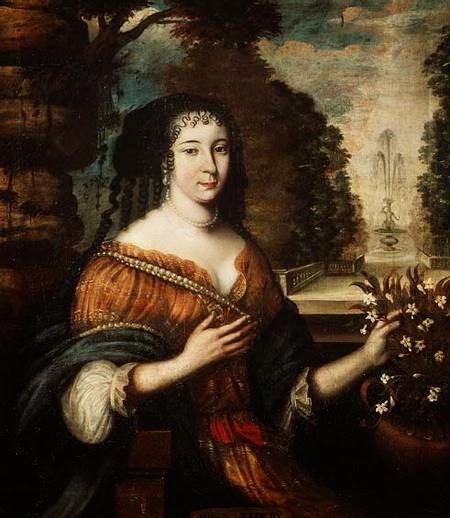 A prominent novelist, Madeleine de Scudéry (1607–1701) composed a series of dialogues dealing with philosophical issues. Primarily ethical in focus, her dialogues examine the virtues and vices proper to the aristocratic society of the period. They also explore questions of moral psychology, in particular the interplay between temperament and free will. In the area of epistemology, Scudéry analyzes the problem of certitude and self-knowledge. Theologically, she defends cosmological arguments demonstrating God's existence. Her aesthetic theory endorses the mimetic thesis concerning art as the imitation of nature but the individuality of artistic perception also receives attention. In her philosophical speculation, Scudéry stresses questions of gender; the relationship of philosophical theories to the condition of women receives substantial analysis. Long framed by her critics as a pedantic précieuse, Scudéry has only recently attracted the interest of professional philosophers. . . . In the recent feminist expansion of the canon of humanities . . . the philosophical significance of her writings has emerged. Her literary corpus presents a novel version of the ancient philosophical method of dialogue; it also expresses original, sophisticated theories concerning the ethical, aesthetic, and theological disputes of early modernity. The Story tells of Sapho, a woman writer modeled on the Greek Sappho, who deems marriage slavery. Interspersed in the love story of Sapho and Phaon are a series of conversations like those that took place in Scudéry's own salon in which Sapho and her circle discuss the nature of love, the education of women, writing, and right conduct. This edition also includes a translation of an oration, or harangue, of Scudéry's in which Sapho extols the talents and abilities of women in order to persuade them to write. *When I was in graduate school, my professors went on and on about Samuel Richard's Clarissa, estimated to be 984,870 words long. Ha!!!!! Less than half as long as Artamène!